When Andy and I got married, we decided that we would alternate our Christmas's between our families. This year is the year we head to Atlanta to spend Christmas with Andy's parents and friends. It's always a blast, will post about it when it happens. So, last night we celebrated Christmas with my parents and family. 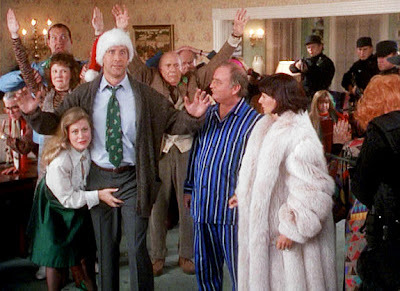 Or, as I like to call them, the Griswold's. I knew Andy was the one for me when I discovered we shared a love for Christmas Vacation. 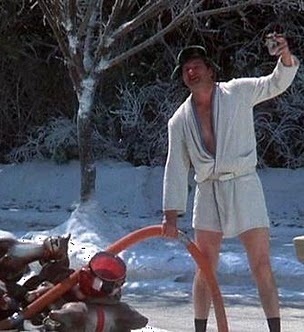 It had nothing to do with anything else but our love for Cousin Eddie and Clark. My mom always makes the house look so pretty for Christmas. It was such a nice night. Lucy is at the perfect "Christmas age". She loves opening her presents and looking at the Christmas tree. She loved her presents from CiCi and D (me and andy). We got her an extremely large yellow lab pillow pet who she has named "Bir Bir" (Birdie), a Mr. Potato Head family, and a Radio Flyer tricycle. Her favorite, by far, was the tricycle. She kept saying "Yucy's bicycle! Yucy's bicycle!" 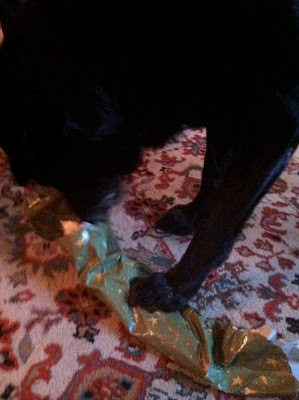 Even Scout opened some presents. The dogs had a good time, too. And I made a chocolate cream pie for dessert. It was yummy...recipe to come soon. I cannot WAIT to fry up something! Maybe some shrimp, oysters, or beignets! The possibilities are endless...and my a$$ might be endless thanks to this little guy. But that's what new year's resolutions are for, right? Looks like a great Christmas celebration! Don't forget to post that chocolate pie recipe.